How Far is Marg Kalpa Vriksha? Karapakkam is well known that it is heart of IT Corridor and the project is adjacent to IT companies,Education centers like colleges, universities, Health centers and many commercial centers / shops. Kalpavriksha is being on OMR and having connectivity from Sholinganallur and Thoraipakkam is has all around roads so that the resident will have Traffic free zone benefits being in to OMR. Kalpavriksha is just adjacent to a Commercial Mall, which will be in operation in another 2 years time,the views from the balcony to Mall is excellent. It is also surrounded with many residential projects. With all the above benefits the flat owner can have work life balance by having very limit time on his daily commute to office or his every need. 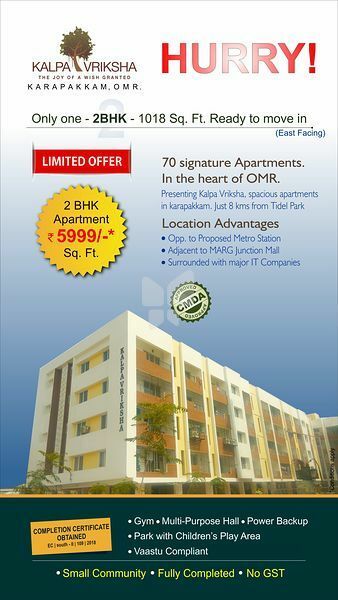 Even the rental remuneration for the location will be much higher than other location in OMR. Design: Kalpavriksha was designed by one of the leading Architect in Chennai and keep in mind of providing good ventilation and sun light to all the apartments. 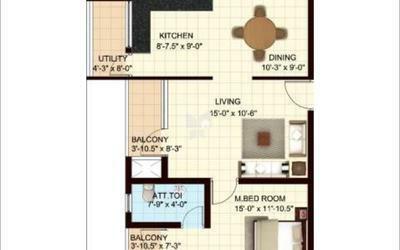 There will be a huge open space on both side of every flat. Structure: The structure of the Building is Stilt + Floor and having the total dwelling of 70 Units with the land extent of 1.2 Acres. Uniqueness: The project was designed such a way that there should not be any waiting time for lift and ensured that every 3 apartments in each floor has a separate Lift and not like usual 1 lift for 10 to 12 apartments in each floor. Kalpavriksha is more than a wish granted. This Project offers 2/3 BHK Apartments at very reasonable prices.